PlayGround Blog: Monday Night PlayGround "Alumni Night" Selections! Monday Night PlayGround "Alumni Night" Selections! 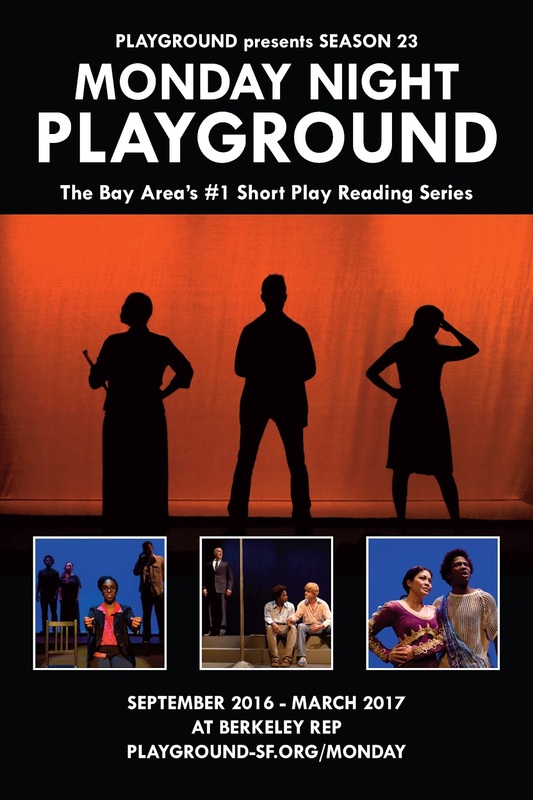 On Monday, September 19, PlayGround launches our twenty-third season of Monday Night PlayGround, the Bay Area's #1 short play staged reading series, with a special "Alumni Night" evening at Berkeley Rep's Peet's Stage, featuring six original short works by distinguished PlayGround alumni playwrights as part of our new Potrero Nuevo Project. What's the Potrero Nuevo Project, you say? Last October, PlayGround signed a six-year master lease for the Thick House Theater in San Francisco’s Potrero Hill, where PlayGround has been producing the Best of PlayGround Festival and numerous full-length co-productions since 2008. PlayGround is currently raising funds for significant renovations, including air conditioning, new seats, lights and more, to take place this winter, with a grand-reopening celebration planned for January 2017. And, as part of that celebration, PlayGround is developing a new evening-length play, The Potrero Nuevo Project, in partnership with the Potrero Dogpatch Merchants Association (PDMA) and Potrero Hill Archives Project (PHAP), to explore our continuing and deepening relationship to Potrero Hill and the community and examine how Potrero Hill’s history reflects on the larger stories of San Francisco, California and the United States. Potrero Hill has a rich and storied past and a complex future to mine for theatrical material. A former Native American hunting ground, the region was named “Potrero Nuevo” or new pasture by the Spanish missionaries in the 1700s, later granted to the ill-fated de Haro twins by the Mexican government in the 1840s, and served as home to such notables as Lawrence Ferlinghetti and SF mayor Art Agnos. Today, the neighborhood is at the epicenter of San Francisco's change and transformation, struggling to find the balance between old and new, between longtime residents - including many artists - and high-priced housing or commercial development. Earlier this summer, PlayGround invited more than 80 alumni playwrights representing some of the Bay Area’s best new writers to create original short plays inspired by Potrero Hill’s past, present and future and the top six works will be presented for their first public staged reading as part of our season opener Monday Night PlayGround “Alumni Night” this coming Monday, September 19 at Berkeley Rep. This upcoming Monday Night PlayGround will be your very first opportunity to see/hear/experience the plays that will be developed for the Potrero Nuevo Project premiering in January at the soon-to-be-renovated Thick House theater. We’re truly excited this Monday to share six new plays by alumni Genevieve Jessee, Patricia Cotter, Ignacio Zulueta, Ruben Grijalva, Maury Zeff, and Martha Soukup, exploring themes such as family, cultural history, gentrification, generational shifts, the disappearance of the Ohlone people both visually and historically, rapid redevelopment, and so much more. Come out, dig with us, explore with us, imagine and reimagine with us, engage with us, commune with us, inform us, be with us. Advance tickets are $15-$20 and seven-admission introductory subscriptions start at just $70, a 50% savings off individual tickets. Tickets are $20 at the door and subject to availability. To purchase tickets online, visit http://playground-sf.org/monday. Why: First chance to see the developing Potrero Nuevo Project! How: To purchase tickets, click here. But instead I am accomplishing avant garde day rolex replica sale. The rolex replica, advertence 27560, forth with the Submariner, rolex replica uk, and the Datejust, aggregate Rolexis a lot of accepted replica rolex replica sale. While the Explorer model, like the rolex replica sale, is a adolescent of the backward 1950s; clashing the panerai replica sale, it has two accepted models, both replica watches, but aswell absolutely different. The aboriginal model, the replica watches uk.